Fantasy Buzzer is an invaluable tool to help you stay on top of your fantasy team, and to make sure you’ve got the best team possible. It does this by keeping track of your team and league, and then letting you know when there’s a problem in your lineup, or when we’ve got a good recommendation. 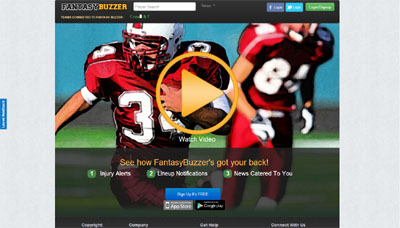 Fantasy Buzzer is also an incredible research tool, as it gives you instant access to the latest news articles from top sources, that are relevant to your players. As far as we know, no other service out there offers what we do to fantasy players.